The Golden Age of Christmas Songs? It was today in 1950 that Alex Chilton of Big Star was born. In a sad coincidence it was also yesterday in 1978 that Chris Bell of Big Star died in a car crash. In honour of the 63rd anniversary of Alex Chilton's birth and the 35th anniversary of Chris Bell's death, then, I thought I would leave you with a song by Big Star. It is my favourite song that they ever did, "September Gurls". From my perspective LinkedIn, the social networking site for professionals, has always had a bit of a problem. On the one hand, the media (both the mainstream media and the more specialised tech media) seem to adore LinkedIn. I do not know how many articles I have seen on how important it is for professionals to be on LinkedIn, on how one can find a job through LinkedIn, on how important LinkedIn is to sharing information among professionals, and so on. On the other hand, it seems to me that the average person, even professionals, is largely indifferent to LinkedIn. They use LinkedIn as little more than a place to put their résumé online. They create a profile and then may not visit the site again until they need to update their profile (which may literally be months, if not longer). I am more active than most people I know on LinkedIn, and I only make an update there only every few days, much less than on Google+, Twitter, or even Facebook. Despite the media's love affair with LinkedIn, it seems clear to me that the site really needs to encourage individuals to be more active on the site. Unfortunately on 16 December LinkedIn did something that I believe will do the exact opposite. Quite simply, they removed the activity feed from individuals' profiles. According to the help page on LinkedIn, this was "...so we can better invest those resources in building new and better LinkedIn products." Unfortunately, from what I have seen on both Twitter and LinkedIn itself, it seems a good many users disagree with the site's decision. I know I am one of them. Indeed, on the surface LinkedIn's decision seems to make little sense. Nearly every other major social network includes a feed of one's own posts on one's profile. This is true of Twitter. It is true of Google+. It is true of Facebook. And I personally believe there are very good reasons for this beyond simply being able to see all of one's own posts in one place, reasons that for some odd reason LinkedIn has chosen to ignore. First, having the activity feed on one's profile encouraged others to visit one's profile to see whatever updates one has made. I know that there were people who visited my profile regularly to see my updates. Now they have little reason to do so. This brings me to the second reason for having the activity feed on one's own profile. Quite simply, it insures that one's updates will be seen, at least if people visits his or her profile. Without an activity feed on profiles, chances are good that one's updates will be lost among the "noise" on the activity feed on LinkedIn's main page. Indeed, the sad fact is that the activity feed on LinkedIn's main page is a hot mess, much worse than even Facebook's news feed. Worse yet, one has little control over what appears in the activity feed on the main page. One cannot set the activity feed so that one will not see "such and such liked such and such update" or "such and such has a new photo", or "say happy work anniversary". And while one can hide updates from specific individuals on the activity feed, one cannot hide updates from LinkedIn itself or, a feature I find particularly annoying, "Your network's talking about" (essentially topics LinkedIn thinks one's network is discussing). Now there are individual feeds for "Connections (new connections people have made)", "Shares (links one have shared, whether they're blog posts, news articles, videos, or so on), and Profiles (essentially profile updates), but they are little help. Indeed, the Shares feed has the same noise problem as the "All Updates" activity feed. On the Shares feed one will still see updates from LinkedIn, sponsored updates, and "Your network is talking about". On the "All Updates" activity feed and even on the "Shares" feed, then, it seems to me that the chance of one's updates getting lost in the noise is very, very good. A third problem with eliminating the activity feed from individual profiles is that it is now much more difficult to tell if someone is actually active on LinkedIn. For instance, someone visiting my profile would have been able to tell that I make updates every so many days. By the same token, someone visiting my brother's LinkedIn profile would see that he has not updated in quite sometime. While it doesn't matter to me, I rather suspect many professionals on LinkedIn would prefer to be connected to people who are actually active on the site. This brings me to a fourth problem with eliminating the activity feed on LinkedIn. It was a good way of weeding out spammers. If one visits the profile of someone and his or her activity feed is filled with links to nothing but pages promoting "male enhancement products", it is fairly certain that he or she is a spammer! In the end I have to say that in eliminating the activity feed LinkedIn has made a very serious mistake. They have taken away the primary reason for people to visit other's profiles and also made it more difficult for individuals' updates to be seen. They have also removed a useful tool for telling if someone is active on the site or if they are a spammer. What LinkedIn has apparently failed to realise is that while there may be newer LinkedIn products than the activity feed on profiles, there are and can be none better. I have to wonder that ultimately LinkedIn's removal of activity feeds won't result in people updating much less often, if at all. Indeed, I have to wonder that it won't result in some people leaving the site entirely. Either way I have to wonder that in eliminating the activity feed from profiles LinkedIn has not effectively consigned itself to oblivion. For many in the United States today is the day after the Christmas season. They will take down their Christmas trees. They will take down their Christmas lights. Every single Christmas ornament will be taken down and put into storage. And while I suspect that while there are many who are relieved that the Christmas season is "over", there are many of us who are a bit down because most of society thinks the Yuletide is over. It wasn't always this way. Indeed, the original Twelve Days of Christmas run from the evening of 24 December (Christmas Eve) to the day of 6 January (Epiphany). The traditional Twelve Days of Christmas developed very early in the history of Christianity, and many of the customs associated with the season have their origins in the Germanic pagan festival of Yule (called Géol in Old English) and the Roman pagan festival of Saturnalia. In England during the Middle Ages the Twelve Days of Christmas were a time of nearly continuous celebration, with the festival climaxing on Twelfth Night (the evening of 5 January). The early colonists of North America would bring the custom of the Twelve Days of Christmas with them from England, Scotland, Ireland, and Germany. The Twelve Days of Christmas are still celebrated to some degree in the United Kingdom and the Commonwealth (indeed, in the UK and in many Commonwealth countries today is Boxing Day), but over time it was forgotten here in the United States. It is difficult to say why the Twelve Days of Christmas ceased to be celebrated in the United States, but I suspect much of it has to do with the holiday shopping season. The Christmas shopping season evolved over a number of years starting in the late 19th Century. New York City sweet shops held Christmas sales as early as the 1820's and 1830's. By 1840 many stores began to advertise themselves as "Santa Claus' headquarters". In 1874 Macy's set up the first of their legendary Yuletide window displays and had Santa Claus in the store for the first time. Eventually the day after Thanksgiving (now known as "Black Friday") would come to be regarded as the first day of the Christmas shopping season in the United States. As early as 1907 the The Evening Times of Cumberland, Maryland made reference to shopping on the day after Thanksgiving. In an issue of The Indiana Progress dated November 27, 1917, a retail store makes reference to their holiday line being ready the day after Thanksgiving. There can be no doubt that by the Thirties the day after Thanksgiving was considered the first day of the Christmas shopping season in the United States. Indeed, it was in 1939 that President Franklin Delano Roosevelt moved Thanksgiving from the last (and that year, fifth) Thursday of November to the fourth Thursday of the month in order to create a longer Christmas shopping season. The move proved controversial and in 1941 Congress established the fourth Thursday of November as the date of Thanksgiving in something of a compromise. Regardless, it seems likely to me that during the 20th Century (and probably very early in the 20th Century at that) the Christmas shopping season in the United States became conflated with the Yuletide itself. People stopped thinking of the Yuletide as the evening of 24 December to the day of 6 January and began thinking of it as lasting from the day after Thanksgiving to 25 December. Christmas Day, once the beginning of the festival, effectively became the end. To me the conflation of the Christmas season proper with the Christmas shopping season in the United States is most regrettable. Quite simply, to me starting the celebration on the evening of 24 December and ending it on the day of 6 January is far better than starting it on the day after Thanksgiving and ending it on the day of 25 December. First, it must be considered that Christmas, like the Germanic Yule and Roman Saturnalia from which it borrows much of its imagery, is essentially a winter festival. Even today much of the imagery associated with Christmas is that of winter: snow, snowmen, Santa's fur lined suit. The songs associated with the holiday often mention winter imagery, even in their titles: "White Christmas", "Let it Snow, Let It Snow, Let It Snow", "Frosty the Snowman", and so on. The imagery of the Yuletide stands in stark contrast to the Christmas shopping season in the Untied States, now regarded by many Americans as the Christmas season. Astronomically winter does not begin until 21 December. This means the majority of the Christmas shopping season unfolds during autumn, when there is little chance of snow, much less cold weather, in many parts of the United States (indeed, here where I live there is even little chance of snow on Christmas Day itself). I suspect that this is why many Americans have trouble getting into the Christmas spirit. Quite simply, it's not yet winter and as a result it doesn't feel like Christmas. Another reason the traditional Twelve Days of Christmas is superior to the American Christmas shopping season is that in many respects it would be more advantageous to the very merchants who invented the Christmas shopping season. As Christmas is celebrated in the United States today all gift giving is centred on brief time: Christmas Eve and Christmas Day. Despite this, it was traditional to give gifts throughout the Twelve Days of Christmas. Indeed, the idea of giving gifts on all twelve days of the Yuletide forms the basis for the classic Christmas carol "Twelve Days of Christmas". In focusing all of their attention on Christmas Day, then, merchants are ignoring eleven more days during which gifts could be given. And, of course, the more gifts given, the more money they would make. Quite simply, the day after Thanksgiving would no longer be quite so important as far as Christmas shopping goes! Third, I think the traditional Twelve Days of Christmas might be better for Americans' mental health. Let's face it, January can be a very depressing time for many Americans, and I think it is because of more than the holiday season being over. It's cold. The nights are long and the days are short. If you live in a small town or rural area there is often very little to do. In returning to the Twelve Days of Christmas, then, we could make at least the first few days of January a little brighter. Christmas carols would still play on the radio. The lights and trees would still be up. Suddenly the drab and dreary days following the New Year would be a little merrier. Indeed, we would have one more day to celebrate. In addition to Christmas Day and New Year's Even, we would have Twelfth Night! This would be of great help to the average American in that they might no be quite so susceptible to the January depression common to many. Ultimately, I think a return to the Twelve Days of Christmas would be very beneficial to Americans and much preferred to the Christmas season as many celebrate it today. Regardless, I will keep my tree and my lights up until at least the day after New Year's Day. And I will continue to listen to Christmas music too. For me the Yuletide does not end with 25 December. Today is Christmas Day, so as usual I will have a full blog post for you. Instead I will give you my usual gift of Yuletide pin ups from the Golden Age of Film. First up we have Jane Powell who is ready to go sledding! Next we have Esther Williams and a friend. Clara Bow drags her gifts from her many admirers to her igloo. Iris Adrian apparently intends to decorate her chimney with a wreath! Debra Paget bearing a gift. I Wish All of You a Very Merry Yuletide and a Happy New Year! Classic film buffs who celebrate the holiday generally have their favourite Yuletide films. These are films they watch every single holiday season without fail, films that make the season feel more like Christmas. At the same time, however, there are those films that are often shown this time of year that leave at least some classic film buffs scratching their heads and saying, "Why did they show that? That's not a Christmas movie!" I know it happened to me a few Christmases ago, when TCM showed both Little Women (1949) and Meet Me in St. Louis (1944) on Christmas Day. Certainly what is considered a Christmas movie will vary from classic film fan to classic film fan, but for me it comes down to a few things. First, most of the film must be set at Christmas. The final scene in the classic spy spoof The President's Analyst (1967) is set at Christmastime, but given the majority of the film is set earlier in the year, it hardly qualifies as a Christmas movie. Second, Christmas must have a significant impact on the plot of the film. The classic Ocean's 11 (1960) starts around Christmas, but the holiday has no real impact on the film's plot (although New Year's Eve does). I would then say this disqualifies Ocean's 11 as a Christmas movie. Third the film must have strong themes related to the holidays. This is true of the most famous Christmas movies of them all. It's a Wonderful Life (1946), Miracle on 34th Street (1947), The Bishop's Wife (1947), and so on all have this in common. Now I have to say that films do not have to meet all of these criteria to be Christmas films. If they meet only one that is fine by me. That having been said, there are films shown this time of year that I would not consider Christmas films because they meet none of these criteria. While I love the aforementioned Meet Me in St. Louis, I do not consider it a Christmas film because of this. The film has does have a sequence set at Christmas (featuring the classic song "Have Yourself a Merry Little Christmas", no less), but it is only one sequence in a plot that stretches out over several months. Indeed, Meet Me in St. Louis also has a sequence set at Halloween (which I think may actually be longer than the Christmas sequence), but I don't consider it a Halloween movie either. While Christmas does have a significant impact on the plot, that impact is no greater than the sequences in summer or at Halloween. 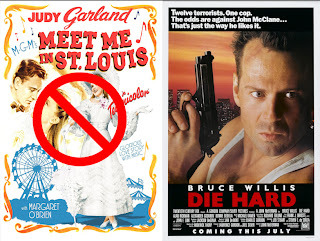 In the end, I just can't see Meet Me in St. Louis as a Christmas movie. In fact, I prefer to watch it in the springtime! Another film frequently shown this time of year that I love but I do not consider a Christmas film is Auntie Mame (1958). While there is a sequence set at Christmas, if anything Christmastime plays an even less important role in Auntie Mame than it does in Meet Me in St. Louis. It is only a relatively brief sequence set in a plot that spans literally years. For me, then, Auntie Mame is something like The President's Analyst. A few scenes at Christmas does not make it a Christmas film. Of course, earlier I mentioned Little Women (1949). It seems as if both it and the 1933 version are shown frequently this time of year and I have never quite understood why. Like Meet Me in St. Louis both versions of Little Women have scenes set at Christmastime, but they are only a small part of a plot that is set over an extended period of time. What is more, in both versions of Little Women I would have to say that Christmastime is even less important to the plot than other times of the year. Keeping in mind that, unlike Meet Me in St. Louis and Auntie Mame, I have no real love for Little Women. I find both versions exceedingly depressing to the point that they would not be suitable for holiday viewing even if Christmas played a bigger role in the films! At least Meet Me in St. Louis, Auntie Mame, and Little Women have scenes set at Christmastime. This is not true of one film that is frequently shown this time of year, The Sound of Music. Indeed, not only are there no scenes set at Christmas, the holiday is not even mentioned in the film! It isn't even mentioned in any of the songs, which brings up the mystery of why "My Favourite Things" is played so often this time of year as well. Granted, I never cared for The Sound of Music (although I love the songs and Eleanor Parker), but even if I did I would not consider it a Christmas movie, nor would I consider "My Favourite Things" a Christmas song! Of course, while there are films that are shown frequently this time of year that I do not consider Christmas movies, there are also films I do consider Christmas movies that are not often shown this time of year for whatever reason. Indeed, one of them numbers among my top five films of all time, The Apartment. The Apartment is certainly set during the holidays. It takes place over a period spanning from a little bit before Thanksgiving (or at least that's the impression I always had) to New Year's Eve. What is more, Christmas Day plays a very important role in the plot. Quite simply, the plot of The Apartment probably would not work (or at least it would be very different) if it was set at any other time of year. What is more, The Apartment touches upon themes of redemption that are very much in keeping with both Christmas and New Year's. Sadly, despite all this, it seems to me that The Apartment is rarely mentioned as a Christmas movie or shown during the holiday season very often. Another film that qualifies as a Christmas film in my mind might surprise some readers. Quite simply, even though I first saw it in the summer, I've always thought of Die Hard (1988) as a Christmas movie. What does an action film about a New York cop fighting terrorists in a skyscraper have to do with Christmas? First, the entire film is set on Christmas Eve. This already makes it more of a Christmas movie than Meet Me in St. Louis, Auntie Mame, and Little Women. Second, the terrorists seized the Nakatomi Plaza building just as a Christmas party was taking place, complete with Christmas music and a gigantic Christmas tree. Third, the film deals with themes of reconciliation and redemption fitting the holiday. I suspect the only reason that Die Hard is not generally thought of as a Christmas movie is that it an action movie and hence not exactly a traditional Christmas movie. Regardless, using my criteria above, it certainly qualifies as a Christmas movie. 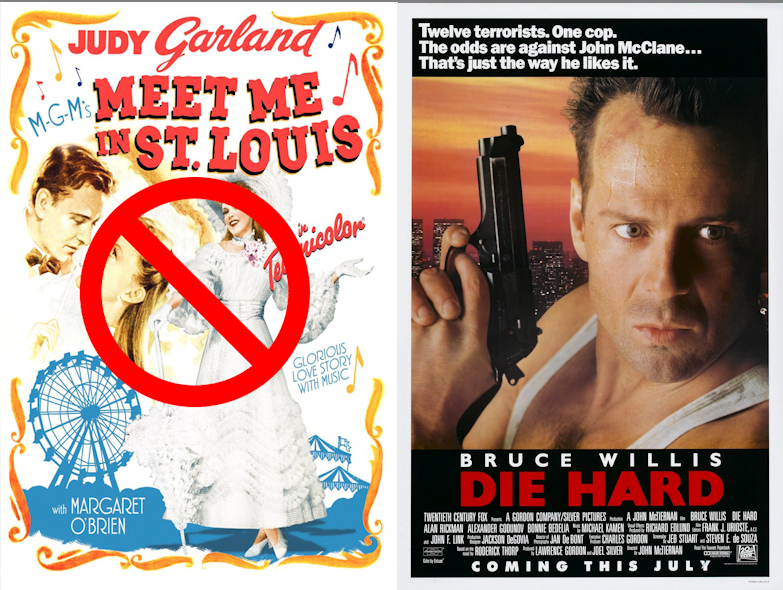 I realise from my perspective that Die Hard is a Christmas movie and Meet Me in St. Louis is not that some might question my criteria for what is a Christmas movie. That having been said, to me a Christmas movie is one that makes one feel the Yuletide spirit, and for a film to do that for me it must meet some of those criteria for the entirety of the film. While Meet Me in St. Louis might make me feel the Yuletide spirit during the Christmas sequence, it doesn't during the rest of the film. Die Hard actually does succeed for me on that account. Of course, in the end what is and is not a Christmas movie is entirely subjective. In the end, as I said, a Christmas movie is ultimately one that makes one feel the Yuletide spirit. For me it takes the criteria I mentioned. For others it might be as enough for a short sequence in which Judy Garland sings a classic Christmas song. While the holidays are an event celebrated by people at large, they are also highly personal. And while Yuletide celebrations vary from family to family, I suppose so too do what people think of as Christmas movies. If anyone spends much time listening to Christmas songs on the radio, on the internet, or in the many stores that play them during the season, they might soon realise one thing. The vast majority of popular Christmas songs played today are fairly old. "White Christmas" was first released in 1942. "Rudolph the Red-Nosed Reindeer" dates to 1949. "It's the Most Wonderful Time of the Year" is actually one of the younger Christmas standards. It only dates to 1963. Why do so many of the popular Christmas songs to which we still listen go back several decades? The reason is simple. The mid-20th Century saw something of a Golden Age of Christmas songs. Indeed, the bulk of the most popular Christmas songs date from a period lasting from the early Forties into the mid-Sixties. This is not to say that there weren't Christmas songs recorded earlier. "Parade of the Wooden Soldiers" dates to 1922, while both "Santa Claus Is Comin' to Town" and "Winter Wonderland" came out in 1934. And there have certainly been a few hit Christmas songs in more recent years. John Lennon's "Happy Xmas (War Is Over)" dates to 1971, while Mariah Carey's "All I Want for Christmas is You" was released in 1994. That having been said, the mid-20th Century appears to have been a boom time for Christmas songs. From 1942 to 1964 there was at least one Christmas song that became a huge hit each year, and in some years there were many more. If there can be any doubt that the period of 1942 to 1964 was a Golden age for Christmas songs, one must consider that not only were there a huge number of hit Yuletide tunes released during that time, but some of them would become the best selling singles of any genre. In fact, the biggest selling song of all time is still a Christmas song, "White Christmas" by Bing Crosby. Released in the year 1942 it became the best selling single of all time, a position it had kept to this day. For several years the second best selling single of all time was another Christmas song. "Rudolph the Red-Nosed Reindeer" by Gene Autry, released in 1949, sold more than 12.5 million copies and still numbers among the best selling singles of all time. Among the other Christmas songs from the era that rank among the top selling singles of all time are "The Chipmunk Song (Christmas Don't Be Late)" by The Chipmunks and "The Little Drummer Boy" by the Harry Simeone Chorale, both released in 1958. Of course, the years 1942 to 1964 are not only remarkable because it saw some Christmas songs sell phenomenally well, but also in that many years would see multiple Christmas songs become hit records. The year 1949 alone saw "Baby, It's Cold Outside" (multiple versions of the song, at that), "Blue Christmas" (also multiple versions), "Sleigh Ride" by Arthur Fiedler and the Boston Pops, and, one of the all time champs when it comes to Christmas songs, "Rudolph the Red-Nosed Reindeer" all become hits. The year 1958 saw the releases of "The Chipmunk Song (Christmas Don't Be Late)" by The Chipmunks, "The Little Drummer Boy" by the Harry Simeone Chorale, "Rockin' Around the Christmas Tree" by Brenda Lee, and "Run Rudolph Run" by Chuck Berry. What is more, these were not the only years in which multiple Christmas songs ranked high on the American singles charts. A portion of the Golden Age of Christmas songs also coincided what could be considered the Golden Age of Christmas films. It was a period from about 1942 to 1950 that saw the release of some of the most popular Christmas films of all time, including It's a Wonderful Life (1946) and Miracle on 34th Street (1947). It should come as no surprise, then, that some of the Christmas songs of the era came from movies. "White Christmas", the biggest Christmas song of all time, originated in Holiday Inn (1942), as did "Happy Holiday". "Have Yourself a Merry Little Christmas" also originated in a movie, namely Meet Me in St. Louis (although it isn't really a Christmas film). "Silver Bells" originated in the holiday themed Bob Hope vehicle The Lemon Drop Kid (1950). "Santa Baby" was recorded by Eartha Kitt in 1953, but there can be no doubt that its inclusion in the 1954 film New Faces helped popularise the song. Of course, in the latter part of the Golden Age of Christmas songs television would play a role in popularising Christmas songs as well. For the Rankin/Bass, stop motion animated special based on his hit song, Rudolph the Red-Nosed Reindeer, Johnny Marks wrote several new songs. One of the songs from the special, "A Holly Jolly Christmas", became a huge hit for Burl Ives in 1964, while "Silver And Gold" from the special would also become something of a Christmas standard. Andy Williams' song "The Most Wonderful Time of the Year" also emerged from television. George Wylie, the choral director on The Andy Williams Show, wrote the song specifically for the show's second Christmas edition. Following 1964 the number of Christmas songs that became huge hits, let alone Christmas standards, declined a good deal. "We Need a Little Christmas" from the Broadway musical Auntie Mame, released as a single in 1966 featuring Angela Lansbury and the cast, went onto become a Christmas standard, while the novelty song "Snoopy's Christmas" by The Royal Guardsmen from 1967 is still played to this day, but for the most part the years following 1964 would see far fewer Christmas hits than the years before them. It might seem curious that the mid-20th Century would produce so many hit Yuletide songs, but the reasons it did so are not hard to find. It is perhaps no coincidence that the Golden Age of Christmas songs began in 1942. The United States was embroiled in World War II and there can be no doubt that both those on the homefront and the soldiers at war could use some Christmas cheer. Following the war there was a general boom in Christmas. It was during this period that decorating one's house with lights for the holidays became common. It was also the period during which many classic Christmas films (It's a Wonderful Life, The Bishop's Wife, Miracle on 34th Street, and others) were released. It seems likely that soldiers returning home from the war wanted a Christmas like those they had when they were young. And if they went a bit overboard in celebrating the holidays, well, that was perhaps because they had been denied a typical, family Christmas for many years. With a demand for anything Christmas related, it should not be surprising if songwriters and recording artists weren't happy to fill the demand. As to why the Golden Age of Christmas songs ended, that is harder to say. I doubt it was the advent of rock 'n' roll. The Golden Age continued until 1964, many years after the arrival of rock 'n' roll on the scene. It must also be pointed out that rock 'n' roll artists would make their own contributions to the genre during the era. Elvis Presley covered several Christmas standards. Chuck Berry recorded "Run Rudolph Run", while Darlene Love recorded "Christmas (Baby Please Come Home)". That the Golden Age of Christmas songs ended in 1964 might lead one to believe that the British Invasion was responsible for its demise. While The Beatles did make Christmas records, these were only issued to members of their fan club and, except for "Christmas Time is Here is Again", contained no original Christmas songs. Other British Invasion bands recorded little in the way of Christmas songs in the Sixties, although many would do so later (the most famous perhaps being "Father Christmas" by The Kinks in 1977). Of course, even given the British Invasion bands recorded little in the way of holiday tunes, it seems unlikely the British Invasion was solely responsible for the end of the Golden Age of Christmas songs. In fact, it might not have had much impact at all. The fact is that from 1942 to 1964 there were several Christmas songs produced a year and an inordinate number of them became hits. If one were to look at a list of the hit Christmas songs one might well be surprised at how many there actually were. Given the Golden Age of Christmas songs lasted around 22 years and given the number of hit songs released during the period, it seems possible that there was simply a glut created on the market. Quite simply, then, the reason there have been far fewer hit Christmas songs since that time may simply be because there were so many in the years from 1942 to 1964. Not only must a newly released Christmas record compete on the charts with non-holiday offerings, but it must also compete with the old standbys for airplay. And I rather suspect that the majority of times the old Christmas standbys will win out. Regardless, there can be no doubt that the years 1942 to 1964 produced some of the greatest and most popular Christmas songs of all time. A huge number of the holiday classics that we sometimes take for granted stem from those years. While Christmas seems to wax and wane from time to time in popularity, it seems unlikely we will see another period like the Golden Age of Christmas Songs, a time when a holiday themed song could become the biggest hit of all time. The average person is likely to be familiar with the 1938 version of A Christmas Carol with Reginald Owen and the 1951 version of A Christmas Carol (also known as Scrooge) with Alastair Sim. While both of these versions of Charles Dickens' classic novel continue to be popular, even many classic film buffs have never seen the first sound version of A Christmas Carol. Scrooge, released in 1935, is in many ways a forgotten film. 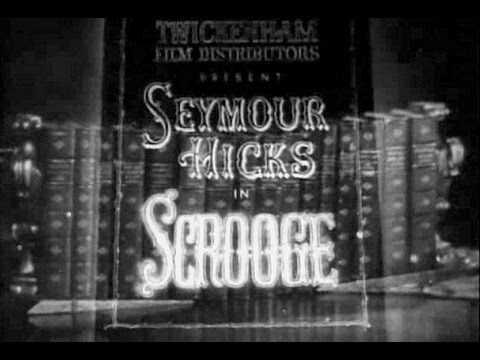 Scrooge (1935) was produced by Twickenham Film Studios and starred Sir Seymour Hicks, who had been playing the character of Ebenezer Scrooge for literally decades by the time the film was made. Mr. Hicks first played the role on stage in a production of A Christmas Carol in 1901. He went onto play the character literally thousands of times on stage. In 1913 he appeared in a silent film based on the novel, simply entitled Scrooge. There can be no doubt that Scrooge was the part for which Sir Seymour Hicks was best known and by 1935 he was the actor most identified with the character. Seen today Scrooge (1935) is an interesting contrast to later films. Those familiar with Charles Dickens' original work will be struck by how much more faithful it is than later film versions of A Christmas Carol. Due to its length Scrooge does omit some pivotal scenes from the novel (most notably the scenes of Scrooge as a young lad at school and as a young man working for Mr. Fezziwig) and other scenes are abbreviated. The setting of one scene (Scrooge's break up with his fiancée Belle) is changed entirely. That having been said, many scenes in the film play out exactly as they did in the novel and the film also includes scenes that are in the novel, but do not appear in many of the other film adaptations. Indeed, it is the only feature film with sound to include the scene of Tiny Tim lying dead in his bed (it was also included in the 1999 TV film version starring Patrick Stewart). Scrooge (1935) must also be given credit for a fairly realistic portrayal of the Victorian London of Mr. Dickens' book, right down to establishing the differences in the social classes. Particularly when compared to MGM's 1938 version starring Reginald Owen (which departed considerably from the novel), Scrooge (1935) is over all a much more faithful film adaptation than most. Scrooge (1935) also differs from later film versions in that we do not see Jacob Marley's ghost on screen. We only hear Marley's voice and see Scrooge's reactions to his presence (Scrooge obviously sees him, even if we do not). On the surface this does not sound as if it would be very effective, but it actually proves to be, largely because of Sir Seymour Hicks' performance. In addition to Marley's ghost, the film also handles the Ghosts of Christmas Past and Yet To Come a bit differently than other adaptations. The Ghost of Christmas Past is seen only as the spectral outline of the actress Marie Ney, although the Ghost's voice is provided by an uncredited and as yet unidentified male actor. The Ghost of Christmas Yet to Come is only seen as a shadow, an effect that in some ways makes him more terrifying than he is in some other, higher budget adaptations of the tale. Only the Ghost of Christmas Present is portrayed as we generally see him in most adaptations of A Christmas Carol. Played by Oscar Ashe, he is largely as Charles Dickens described him--a large jovial man wearing a fur lined robe with a holly wreath atop his head (Dickens was apparently inspired by early depictions of Father Christmas). Of course, there can be no doubt that the star of Scrooge (1935) is Sir Seymour Hicks. After over three decades of playing the character, Mr. Hicks had playing Scrooge refined to an art form. Like other film versions of the character, his Scrooge is suitably gruff and mean spirited; however, unlike some other films versions of the character, Mr. Hicks' Scrooge never succumbs to being merely a caricature. At the film's end, Sir Seymour Hicks convincingly portrays Scrooge's repentance with a good deal of glee, yet still keeps the old miser's transformation realistic. It is a shame that Scrooge (1935) is not better known, as Sir Seymour Hicks gave one of the best performances as Scrooge ever. Donald Calthrop also delivers a fine performance as Bob Cratchit, as does Robert Cochran as Scrooge's nephew Fred. While Sir Seymour Hicks is the undoubted star of Scrooge (1935), credit must also be given to director Henry Edwards. Mr. Hurst made Scrooge (1935) a very dark and atmospheric film. More so than other film versions of the tale, Scrooge (1935) drives home the point that A Christmas Carol is essentially a ghost story. In some respects Scrooge (1935), with its long shadows and dim lighting, seems closer to Fritz Lang's early films than any of the later adaptations of A Christmas Carol. Of course, this is not to say that Scrooge (1935) is a perfect film. Sir Seymour Hicks was 64 years old when he made the film and it is sometimes difficult to believe him as the young Scrooge (perhaps this is why the Ghost of Christmas Past sequence is shorter than the others). Mary Glynne, in the role of Scrooge's fiancée Belle, plays her role a bit too broadly, a case of overacting so bad that it is embarrassing to even watch. It must also be pointed out that while the dark atmosphere of the film is one of its virtues, there are times that it seems a bit too dark. Of course, much of this might have to do with the quality of the surviving prints. Turner Classic Movies showed one of the better prints in existence, but it still showed a good deal of wear. Over all Scrooge (1935) should be counted as one of the best adaptations of A Christmas Carol. It is much more faithful to the novel than some of the more popular versions, and even captures the book's gloomy atmosphere better than most. If anything else, it must be seen for Sir Seymour Hicks' performance as Scrooge, one of the very best ever seen on screen. While any serious classic film buff should see Scrooge (1935) for its historical importance as the first sound adaptation of the tale, it should also be seen as one of the best and most enjoyable adaptations of A Christmas Carol as well.